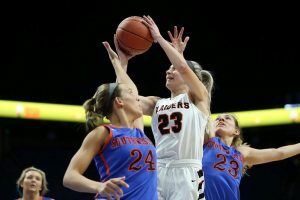 Orange and black – not green — were the winning colors on St. Patrick’s Day as the Ryle Lady Raiders rolled to the championship of the 58th KHSAA Girls’ Sweet Sixteen before 5,607 fans in Rupp Arena. Maddie Scherr, one of the top juniors in the nation, was named the tournament’s MVP after exemplifying what it means to be an all-around player. The 5-foot-11 point guard totaled 52 points, 31 rebounds, 11 assists, 10 steals and 9 rebounds in helping Ryle sweep past Murray, Clark County, Owensboro Catholic and Southwestern. 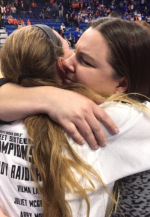 Ryle Coach Katie Haitz and senior standout Lauren Schwartz embrace after the Raiders’ title game victory. Scherr, who’s being recruited by Kentucky, Louisville and Oregon (among many others), tweaked her right hamstring in Saturday’s semifinals, but she wasn’t going to let that keep her from taking the floor for the season finale. Ryle also got timely contributions this week from 5-9 sophomore Brie Crittendon, who led the way with 19 points against Owensboro Catholic and 21 against Southwestern; 5-7 junior Jaiden Douthit, who had 17 points against Southwestern; 5-7 senior Juliet McGregor, who had 15 points and 7 rebounds against Owensboro Catholic; and 5-9 freshman Austin Johnson, who provided a spark off the bench. 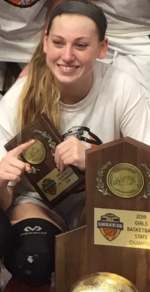 Ryle senior Lauren Schwartz celebrated her team’s state title. “This group of girls knows basketball,” Haitz said. Katie Madden Haitz was a star player at Boone County for Coach Nell Fookes, and went on to have a standout career at Taylor University. She returned home and was an assistant under Fookes for two years. Haitz is in her fourth year at Ryle, and notched her 100th victory this week while guiding the Lady Raiders to a 33-5 record this season. Fookes, who won almost 700 games in her 30-year career at Boone County and is being inducted into the Kentucky High School Basketball Hall of Fame this year, was in Rupp Arena Sunday afternoon to cheer on her former player and assistant. “Katie was a heck of a player, very intense, and she carried that on to coaching,” Fooke said. “She’s at the right place at the right time, she’s got good players, and they’re doing what she wants them to do. As Ryle’s players were cutting down the nets, Haitz was asked about that text from Fookes.